Where to start? I've been using these for years and they are just amazing. Very rarely do I stumble on something this good that I use this much, that I rave about this much, that I recommend this much. Ben Nye products were originally formulated for theatre, making them (as you can imagine) highly highly pigmented and long lasting. These are not just good but unbelievably excellent value. I don't want to say "cheap" because this cheapens it, and a "cheap n nasty" product it most certainly ain't. Every time I'm asked to recommend a cream colour product, these are my go-to recommendations. These are the ones I use in shoots. I use them on brides. I use them myself. These are the ones we play with in class. I don't have CR7 Coral or CR9 Red Rocks (simply because when I was purchasing these were out of stock). My favourites? CR4 Raspberry (for a brighter blush), CR35 Natural (for contouring), CR38 Dusty Mauve (for a natural flush). Incidentally, this one actually works on your lips. I've found that the Stila Convertible Color & Bobbi Brown Pot Rouge, while great, dry out lips after a while. 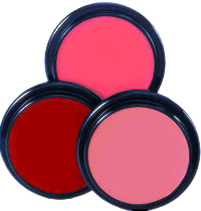 The simplest way to apply any cream blush? Swirl your middle finger into the product, then rub your two middle fingers together. Use these fingers to apply the product, a bit at a time, on either side of your face, and use your (clean) index or ring fingers to blend up and out. No tools necessary if you don't want. Otherwise, as they are so pigmented, I recommend a dual fibre brush or a damp sponge. Works for all skin tones (caution when using creamy products on very oily skin tones applies here, as with all cream products). Works for all ages. Works for all budgets. Highly highly highly recommended.